Coconut water, the liquid from a young unripe coconut, is a natural isotonic beverage filled with immune boosting vitamins and nutrients. This healthy drink offers replenishing electrolytes, as well as potassium, calcium and magnesium. This nutrient rich beverage contains organic compounds with beneficial growth properties that can dramatically improve your health. It is completely free of chemicals and is save for children and babies. Some pregnant women prefer drinking coconut water as a natural aid for digestive problems during pregnancy. The lauric acid found in coconut water is the same as human breast milk. Regular consumption of coconut water can naturally improve immunity, increase metabolism, alter HDL and detoxify the body. Consistent consumption of coconut water can help regulate intestinal function which is known to provide a wide variety of health benefits including a clearer complexion. Coconut water also contains monolaurin which acts as an antiviral monoglyceride which has the abiltiy to kill a variety of viruses and bacteria in the body. Coconut water is a natural sports drink. Providing 15 times the electrolytes than most sports drinks, coconut water promotes hydration by stimulating the plasma which contributes to 55% of human blood. It is contains calcium and serves as a nutritious cholesterol free boost after a workout. Coconut water has fewer calories and sodium than most soft drinks or juices. In addition, coconut water is high in potassium and consumed regularly can significantly reduce the risk of hypertension. 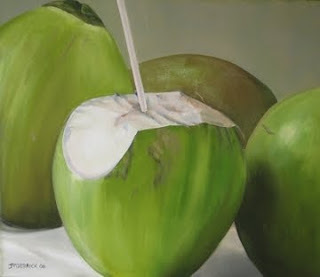 Today there are several ready-to-drink organic coconut beverage available. Some popular brands are Vita Coco, Zico Pure and O.N.E. They all provide fresh coconut water in tetra packaging to preserve nutrients. Now I wish I were in the tropics so I could get some fresh coconut! I'll look for those drinks you mentioned at the natural food store. Thanks! Hey nice post! I just bought oodles of coconut water to take back to Saudi for when I cannot get hold of a real coconut :) I've missed you! This is interesting. I've never heard of drinking coconut water. You don't develop diarrhea? Love this entry. I was born and raised in Africa. Since I have been in North America, I have not had coconut water. Recently I went to Mexico and after many years had a chance to enjoy it!!! Check out my blog at http://www.coolmamablog.com to get more ideas on fitness and wellness. Thanks for the great info. I am a runner and always looking for healthy natural ways to rehydrate other than water. Plan to try some coconut water after turkey day! Coconut water is a natural isotonic beverage filled with immune boosting vitamins and nutrients.. This is some really good information. I have fibromyalgia and Gatorade and other sport drinks seem to help curb some of my symptoms. I will have to try this drink for the chance that it could make me feel much better. Thanks! Great information! Coconut oil has many health benefits and uses as well. I use it for cooking, as a body lotion and hair conditioner. I'm always interested in learning new health tips. Thanks. I was not aware of the benefits of coconut water. Thanks fot the information. Coconut water helps you from having UTI, as well, because it cleans your body. And because it cleans your body, it can help you lose weight. Other than water, I drink coconut water as an alternative. Loads of people are fighting weight loss wars, including me. I hope that in time, by eating the right things and doing exercise, will help me lose weight. Oh, and coconut water, of course. Coconut water has numerous benefits. It's actually low in carbohydrates, 99% fat free and low and in sugars. It also treat kidney and urethral stones. Isn't it good to take a sip?